I have some issues with this. Actually I have a whole subscription. It’s worth fifteen points on the High Blood Pressure Award to me. The thing that terrifies me is that this is a “good” school. This is a school where the teachers genuinely care about this child, and yet this is what he hears. Here is my message today: It is inherently unfair to expect the gifted kid to always be the one to adapt. Somehow I doubt that happened. A mom of a young Mensan I know told me her son records every minute he reads in class because he’s done with his work and is waiting for others to finish. The day before we spoke, he’d had 87 minutes of down time during a single school day. Let’s just take 8.7 seconds and reflect upon that. When you consider that some of the day is lunch and recess, and some is transition time, that means that for a significant amount of “instructional time” (cough, cough) this kid is left to his own devices. Choose wisely how to use that time, young Padowan, or you’ll get a note on your report card. Thank you for waiting, patiently or not, for everyone else to finish. I know your mental muscles can get cold when you’re just marking time and it can be hard to jump right in again, so thanks for that. Thank you for remembering to bring a (thick) book to read every day so you can kill time (see above). Thank you for not screaming with frustration (you know, out loud). Thank you for being willing to come to school every day, even though you know the odds are you won’t learn anything other than how to wait for others to finish, how to remember to bring a book, and how not to scream in frustration. Thank you for being willing to help others even though it can be really hard to explain something that was intuitive to you to someone who thinks very differently from you. Thanks for getting my sarcasm. It’s just another service I offer, and I appreciate the knowing look I get from you. You are my comrade-at-puns. Thank you for sticking with this whole school thing, full of hope that someday it will get better. I’m trying to make that happen. I could just cry over this because it isn’t even rare. It is reality when you’re a gifted child, and it’s just not fair. And don’t bother writing me about how life isn’t fair, yada, yada, yada. I know that, but I’m still sad. I’m sad because there are millions of gifted kids for whom this is their life at school — the one place their cognitive gifts should be most valued. If you’re a teacher, will you please commit right now to never send this note on paper or in person? It’s just not fair. I always got that I’m “quiet”. It wasn’t until rather recently that I learned and accepted that there is nothing wrong with that. I’m an introvert! Now I’m hearing that my son (age 5) needs to “open up” more. It’s so frustrating being told all your life that it’s not okay to just be yourself. unfortunately my son hasn’t learned to not scream out loud out of frustration yet – thus he misses a great deal of instruction, has fallen behind in areas that before he was “taught” them he was a natural genius at them and overall hates school. The notes we get home every day are a micromanagement of his day – a detailing of every frustrated outburst, of every instance of anger at his own imperfection and the occasional act of simply being a silly kid… he tested in the 98th % and yet we have him in special ed to take care of his “emotional needs”… my gut tells me if we took care of his intellectual needs his emotions would rise to occasion, but I’m in the minority. Sadly, I’m looking forward to eventually receiving the awful note you’ve referenced…. though I’d much rather receive the one you’ve written. Your gut is right. My gentle thoughts? Do some mindfulness training – you can find it free online. Help him grab a bunch of tools for a coping strategy toolbox like printable labyrinth, zentangle, and small kooshy balls to squeeze. Thank you Lisa – we’ll look at these again, though they’ve implemented similar if not identical strategies in his classrooms over the years – he’s a bright almost 10 yr old, who knows that being allowed to “take a break” in the SPED room gets him out of the boring classroom… it’s hard to balance the reward they’ve unintentionally built in for him to manipulate and yet instill the discipline at home that seems to be expected by the daily record sheet sent home detailing every little thing he did wrong during the day (and the alleged “partnership” with the school. I often wonder if he weren’t pegged as a “behavior problem” if these notes would still be coming home. they are supposed to be a goal sheet for him each day, but a goal is never set. The detail of every little thing gets annoying as a parent – shouldn’t some of this stuff be typical classroom management? If he weren’t on a “behavior intervention plan” would I ever hear about most of these thing? Do parents whose kids aren’t labeled in such a way get these notes home? Are all other kids angels in the classroom?? All I know is that if I had a behavior sheet, it would really discourage me. For one thing, it’d be really bad. I’m just going to jump in an ask if your son has an IEP due to his “behavioral needs”. If not, I would be tempted to ask for an evaluation and an IEP. With the IEP, they are required to follow the goals set forth. Maybe the evaluation could at least give them an idea that his behavior isn’t what they think it is. If you request an evaluation, they are required to do one and it is free. My son was a little too social and bouncy, so the teacher asked about having him evaluated by a dr. We took him and were told that he just thinks on a different level than the other kids and is bored in class (which we already knew). My daughter, who is severely disabled, has an IEP for her educational needs so I know a little bit about how they work. Thanks for the suggestion, Andi. I also love hearing that a doctor saw a kid and DIDN’T give him meds! Wow, Christine, this is beautiful. Thank you for sharing this. You have a unique ability to avoid discouragement! Nice. I just trained a group of teachers on this specific scenario! Adults can be open to feedback from kids. The way you answer it? “It’s not about smarter; it’s about what’s correct.” Probably wouldn’t go over well, either, actually. Oh THANK YOU for this. This is going to be my son one day. Right now he’s 5, and is no doubt socially gifted. So right now people are often so distracted by how sociable, charismatic, and mature he seems that they forgive him almost anything for being “cute”. He frequently corrects the adults around him and they love it. For now at least. While in school, I had plenty of my own experiences fighting with teachers for trying to correct them. In fact, I’m 31 years old now and still angry about some of them. I can’t wait to hear how this turns out! Your idea – that what cute and acceptable at one age won’t be later – is real. I also totally agree that we can be deeply and lastingly wounded by things people say to us. Keep me posted! My gifted daughter is now in third grade at a great school. Her academic grades are always above average, even in the gifted program. Her “social/emotional” grades are always low … with comments like “she doesn’t work well others and she’s very often frustrated.” Ok, one – she’s 9. Two, she’s working at an almost 5th grade level and trying to cooperate with kids at a 3rd grade level. Yet, as her parent I am somehow supposed to impress upon her to cease this type of behavior. Right, apparently there is some kind of magic switch that I haven’t discovered yet. All of the teachers in this school are certified gifted instructors … yet none of them seem to understand the basic personality traits of gifted kids. They need to get “certified” in that! As the mother of three gifted children ,all three out of college, this all too true. I have said for years that from a strictly economic point of view we are not spending our resources-funds, teachers- where we are going to get the most return on our investment. In a world of limited resources we are rapidly reaching a crunch point. We also need to look closely at those parents of averagely able children who think that their little darlings need to be involved in every sport,dance,etc activity available in stead of going home and doing their homework. Sarah, I love your idea of increasing expectations of typical learners as well. It’s fair to expect kids to do their best! Unfortunately in the U.S., gifted education isn’t going to get the attention it needs and our children deserve until it does become an economic issue, but I fear that by then, it will be too late, at least for my children. 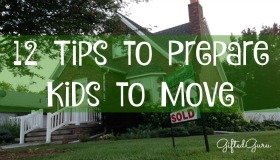 Thanks for a great article, Lisa! Thanks, Leslie. We need another Sputnik! This made me cry. My daughter’s most recent report card came back with very bad marks for cooperative working, behavior toward others, and being courteous toward others. She’s tired of waiting for everyone. She’s bored with going over things that she knew in kindergarten (she’s in second grade), she understands and dishes out sarcasm but her classmates think it’s being mean. Thank you for your well phrased rage at the unfairness of being the gifted kid. I’m so sad when I read this because I know that at some point there is a real risk her love of learning will shut down because of it. Hopefully, with love and support at home, she will overcome the challenge of giftedness. It does make us stronger – those of us who parent gifted kids endured this, and if it doesn’t drive a love of learning out of you, it gives you a passion for it that never dies. I do cry over this. As I pull my children out of school to teach them on my own and therefore am forced to educate myself about gifted children, I cry as I read the books making clear that it was the teachers who were my bullies and not the other kids. You’re not supposed to say you’re gifted, which is bad enough, but you’re also not supposed to act like you’re gifted, which is much harder than acting like you’re not a girl or not a human. We’re asking these kids to be something they’re not as a full-time job. Can you imagine having to be a factory line worker if you were actually trained to be a rocket scientist? Then we wonder why they are all depressed by middle school. Ugh. April, you’re so right – it’s exhausting to have your life be a reality tv show where you’re not really that character. I’m a former gifted kid and the mom to four gifted kids, and you know, I agree that gifted kids have a lot of challenges in school. But I think this post is pretty one-sided. I happen to know that other kids *do* get plenty of comments on their reports cards along the lines of “You should focus on working more efficiently to keep up with the class on tasks.” Or “You need to learn to work more quickly.” There is a ton of pressure on kids who are slowing the class down to get up to speed. To imply that they don’t experience the flip-side of the gifted child’s “be more patient” comments is completely at odds with what I see. For any kid whose abilities fall outside the middle couple of standard deviations there’s tremendous pressure to fit in better with the median group. That’s just the nature of large-group instructional models. I see your point – it’s not right on either side. The gifted kid is not, however, protected by federal law guarding his/her right to be appropriately educated in the way struggling learners are. I know from professional and personal experience it doesn’t always happen, but there is recourse. For the gifted, there’s no recourse, typically. Very Well-said Miranda. And by the way, Lisa, the slow workers are not necessarily the struggling learners. They are just slow by nature. The slowest second grader in my class to get his work done is in the gifted program. Large-group instruction models do face these kinds of challenges. In the 80’s, studies showed that 75% of gifted children end up as blue collar workers. Boredom takes a deep toll. Take a look at the research. If your child is bored in school, due to being on either side of the curve, the odds are against them. Boredom is tricky. It’s like anger – it’s multi-faceted. It can be super deadly in school, for sure! Reading about the 87 minutes made me do a quick calculation – the first half of 3rd grade, my daughter read (reread) Harry Potter #7 in class before Thanksgiving. While I don’t know the time involved, that equates to 15 pages a day of a pretty hefty book. Not so bad, but I remember thinking… that’s a lot of time that could be spent LEARNING something, rather than re-reading a book. She would get asked to help others. She was very patient, waiting for the other kids to finish. She could have gotten this note. Thankfully, she did not… but we had a teacher who seemed at a loss as to what to do with her when we told him that she said she was bored. We were one of the lucky ones. We switched schools, and she’s in a much better place. I feel for all the kids that are stuck with patience and book-reading. I was one of them, too. I’m so happy for your daughter. And I was a school reader, too! I was the gifted student reading tons of books while waiting too. My classmates couldn’t believe I finished all the books I did in one day. I believe, however, that this was a gigantic plus for me. I was already in the gifted program and all this reading only boosted my vocabulary. I felt sorry for the kids who took all their time to do their work and did not have the time to learn to read for enjoyment. So sad to me because these days kids are so busy with after-school activities and video games that discovering reading for enjoyment is on the decline. We are kindred spirits! I totally agree that downtime is necessary to develop a love of reading! How about the teacher teaches instead of leaving the struggling kid to “discover it on his own”? And elsewhere in school the teachers intentionally use the kids who get it to teach the others, in the name of teamwork or the new thing they are calling the “flipped classroom”. So when is a 5th grader supposed to know if he is helping the struggling learner vs. “not being helpful” by letting his peer continue to struggle? I was one of the (not labeled at the time) gifted kids who was bored for-ev-er in school due to waiting for everyone else to catch up. That is a major reason why I have homeschooled my kids since birth. They are gifted too. Too bad that mother won’t consider homeschooling. I homeschooled when we lived in Germany, and I taught all of my children in public school (I let them call me “mom”!). I love it that we live in a country where people can decide what’s best for their families. There’s no one right answer, as you point out. If my name sounds familiar, we had email conversation about EPGY last fall. As I go to my son’s spring K conference, with spouse ditto-ing (is that a word?) the teacher, “let him be a kid,” with preliminary emails with my conference ?s coming back with issues re: scissor work and spacing out during 5th week of 1+0=1 on timed tests that require 100% to advance, while son working on regrouping double digits and fact families up to 20, and paragraph writing for homework while others being tested on just recognizing ABCS. Where was I going… I have been forewarned that as I “was in contact with” the counselor (who asked me if son being challenge appropriately) she will be attending our conference. And I sent her links about article about bullying of gifted kids, but I agree with April that it is often the teacher’s who bully by marginalizing our kids, and as you noted no legal recourse afforded to kids with IEPs for Special Ed. We temporarily uprooted for full-day K offering bi-weely 25 minute “enrichment” but the district snuck that, ability grouping, and apparently most of the math, not to mention any sci and SS out the door due to AYP and RfI -which is what “quiet/nap” time is now designated. If you exceed, or even meet, proficiency, you get to lie still and not move or talk for 1/2 hour, or have your behavior chart moved down if you do. If school allows child to even read now after work done, that is a plus, as some don’tl As a sub I was expected to enforce the rules of nothing else on the desk, nothing under the desk, and child must be on the exact page being discussed. OK, thanks for listening, thanks for starting your lovely blog and wit, and all your efforts as ambassador. Your comment about books sometimes not being allowed reminded me of how when they had standardized testing, I’d go get my kid at 9 o’clock in the morning when he was done! They wanted kids to just sit there in their desks all day long. It’s abuse. Nice polarizing commentary. This is what America is all about! my DD constantly had her thick books taken away. she would lose interest in anything the teacher said because the teacher took 15 minutes to explain what my child understood in 5, then the other 10 just confused her. and it’s NOT my child’s job to TEACH. We homeschool now. Learning speed is the crux of it, isn’t it? She’s lucky to have a mom advocate! This issue frustrates me tremendously. What other quality in life do we try so hard to smother talent? I remember being so bored in school, finishing work early and twiddling my thumbs. Think of the human potential that we are wasting by creating a situation where a child is sitting for 87 minutes in a day. Think of what things would be like if these kids were appropriately challenged and learning new things with all that time. I really wish we weren’t so married to age-level groupings in this country. We homeschool, so I am able to deal with my son being very ahead in some subjects and slightly behind in others. I’d love to see a school that could embrace that and let him grow at his own pace. Age-level grade grouping is public enemy number one! I am torn on this. This year my school ability grouped. The “high” group seems to be thriving, but the “low” group seems stagnant with no peers to push them. There’s actually been some interesting research done on this at the Air Force Academy. If you’re a geek like me and like reading studies, you can read one of them here http://www.econ.ucdavis.edu/faculty/scarrell/peer3.pdf. It’s called the Golem Effect. Putting all the struggling kids together isn’t optimal, at least according to the research (and your observation!). Interesting… then what is the answer??? Luckily, six isn’t too old to recapture joy! Turn him on to Vi Hart’s math or Khan Academy and let him rediscover it! Ben has recently started taking books to school, too. He doesn’t get to read during instruction time, but there are other times during the day where he can read what he wants when other kids are being instructed on other things. We’ve been incredibly frustrated with his teacher this year because she just hasn’t had time to encourage the 6 gifted kids she has in her class, because she’s always so busy with other kids who are much more problematic (there are a handful that give her an extremely hard time). Instead of getting upset when he is bored, or when his teacher is interrupted for the 25th time, he has a funny way of creating his teacher’s inner thoughts in his head when dealing with some of the kids in his class. “She didn’t actually say that, mom, but I know it’s what she was thinking.” So grateful for this kid’s patience when it comes to his schooling! Anyway, finally she approached the group yesterday and asked them if they wanted to do more in reading comprehension (of course they do!) and let them pick a topic to research and present to each other during intervention times (he chose the Revolutionary War). I have never seen him so HAPPY after school! They’ll fill time in class with these special projects while the teacher works with other kids who needs help. You bring out so many important points, Missy! First, his own mental game playing is a fantastic skill. Next, the importance of exercise in all around happiness. The mislabeled map is just beyond what I can even comment on. Can we hope it’s just a typo? She wrote by hand? Those states aren’t even far away! I hope his Revolutionary War research goes well! I wasn’t allowed to have a book to read for most of my elementary years. My son was also forced to sit and wait without a book or anything to do. We now homeschool and life is much much better. I am so glad I found this article today! I have an appointment with my son’s first grade teacher tomorrow morning to talk about math. They’ve just finished yet another round of standardized testing, and now I’m armed their own evidence that his abilities are the same as an advanced fifth-grader. I asked at the beginning of the year to have him sent to a different classroom for his math lessons and was told no, just bring in a workbook for him. I’m asking again tomorrow, and if the answer is again no, I’m ordering Simgapore Math and pulling him out each day on my own. The poor kid deserves to be taught! He’s also in his own “reading group”, an oxymoron that makes me laugh and weep at the same time. And this is a California Distinguished School! I’ve already decided to homeschool next year. Thank you again for your essay – it helps to know that there are teachers out there qualified to teach gifted kids and passionate about sharing their skills! I just wish our school could afford one. Oh, here’s another one you’ll really like: at an IEP meeting last year (kindergarten) when I was insisting that they find something interesting and appropriate for him to do after he’d completed his work, the school’s psychologist actually said to me “he has to learn to be bored”! Aaaargh!!! Wow! Is learning to be bored a state standard now? I grew up in California, and I don’t remember that. In Kindergarten – we want kids to learn to be bored. Wow. Just wow. Perhaps some adults have learned it too well. The rule for me growing up was if I got straight A’s, I didn’t have to go to school if I didn’t want to. Today I’d probably be taken away for truancy, but it was much more beneficial for me to spend my time going to work with my mom, reading, or playing music. It sounds like that strategy really worked for you, yet it seems kind of ironic that school success equals not needing it. It’s sad there wasn’t more there for you. What a flexible, smart mom you have! Great commentary on what so many gifted children face every day. Due to their abilities, they are expected to tolerate the boredom and be grateful when offered a few extra assignments. While many teachers might like to engage them in more meaningful work, the absence of ability grouping in most schools makes it almost impossible to provide the attention they need. Wow, Gail, we think exactly alike. Thanks for sharing your thoughts and including your website. As a gifted resource teacher for 13 years, it is unfortunate that this kind of behavior continues to go on in schools. I remember being in 3rd grade overhearing my parents being told I read on a 12th grade level and they didn’t know what to do with me. Because I was so bored, all through school I underachieved. Finally in adulthood, I had someone give me a great push, and went on to get an education to include my masters. During the 13 years of teaching gifted children, I saw underachievement in my own classroom as well as the regular classrooms. I constantly heard teachers say they are so overwhelmed, the gifted child can adapt and help others. I disagree. I pushed and advocated to provide tiered assignments, differentiation, etc, even doing it myself for the teachers. I was always told the same thing, they had to help the struggling learning first. I like you am very passionate about putting it out there that our gifted children are our country’s future. They deserve to have their needs met just like any other student. Education is the key to making everyone aware of these important children. Wow, Robyn, you just laid the whole issue out with its consequences beautifully. I love that you shared the solution, too. Lisa, I’ve been reading back through your posts and so many of them sum up what it means to be gifted, and/or the parent of a gifted child. So many offer such useful advice. But not this one. My daughter has come home with comments exactly like this on her report card. Does it worry me? No. I take it in the spirit it is meant – as advice meant to help her navigate her social and emotional landscape in the classroom. There are also lots of wonderful comments about how much she wants to help others, about how much she gives of herself and how her enthusiasm for the topic is inspiring for her classmates, BUT she DOES need learn to take a step back and allow other children to make their own discoveries. She DOES need to learn that not everyone has a brain that makes connections as quickly as hers. These are life skills that our school values as much as they do academic skills, because the goal is to develop the whole person, and EVERY child in the classroom has something to learn. Being gifted does not relieve you of the need to function in wider society, and the earlier kids learn those skills, the better. That said,we’re not in the traditional education system, either. There’s no waiting around for everyone else at our Montessori school – there’s no set time to do a task, or even an expectation that everyone does the same thing at the same time. My daughter will work for three hours straight on something that interests her, and then screech through 100 sums in 20 minutes because they had to be finished at some point in the day, or because she wants to sit and read in the corner for a while. A Montessori classroom is only able to work like this because of all the grace and courtesy work the children do from a young age to make them considerate of their fellow students and accepting of the differences between them. There’s no need for an ivory tower in a place where everyone’s strengths and weaknesses are respected, and catered for. I don’t disagree that students need to learn to be patient with differences. What I disagree with is the idea that the onus is on the gifted child to do this. I also object to the idea that gifted kids should be ahead of their age in their social skills. It sounds like your daughter is in an ideal situation for her. If that were true of every child, I wouldn’t have written the post…Unfortunately, there is a disconnect between schools who require students to display skills beyond that which the school itself is willing to show – respect for differences. I agree that the social skills learned at school are valuable. I just don’t know that teaching them through painful experience every day is the optimal way to do that. Mi espanol es muy pobre, pero muchas gracias! I found this article to be negative and really narrow minded about the different learning abilities of kids. A child can be an excellent auditory learner and thrive in a typical classroom, which would make them “gifted”. A child can be a visual learner and not cope so well in a classroom designed for auditory learners and not do as well, but be no less “gifted”. A visual or kinetic learner may appear “slow” but can be equally gifted. I found it really uncalled for to title the note “Dear smart kid”, as that implies all the other students are dumb. It reads like you have disdain for “typical” learners, which I disagree with. Some of the most brilliant people in the world, have not been “typical” learners. Faster is not inherently better. You are welcome to disagree, but I stand by my feelings. School is unfair to gifted kids in a lot of ways. I’m not saying they’re better – I’m saying they have needs, and those needs aren’t met. As far as the whole visual/kinesthetic thing, you may wish to read a little more about that, as even its originator says it never was intended for school. Here’s a link for that http://www.washingtonpost.com/blogs/answer-sheet/wp/2013/10/16/howard-gardner-multiple-intelligences-are-not-learning-styles/. That’s not at all what I’m talking about with giftedness – I’m talking about cognitive intelligence. I don’t have a disdain for typical learners, but your comment just reminds me of why school is not fair — I can’t even express the struggles of gifted kids without being accused of having disdain for others. You’re welcome to your opinion, but I stand by mine. I just want to clarify, I didn’t mean my comments in a remotely disrespectful way. I understand the written word leaves room for misinterpretation. I may have misinterpreted the “Dear smart kid” opening. I don’t dismiss or discount your opinion, having been a gifted kid myself, I just think it is important to not cause derision or confusion about how “smart” is defined . I appreciate the attached link, but it seems that information is limited to neuro-typical people. Non neuro-typical people do learn differently, The sad truth is, most kids’ needs are not met. My intent was certainly not to undermine the existence of the problem of gifted children in schools, but rather to point out a tone in the piece that could be misread. Thank you for reading my comments. I just thought I’d share an example of what my son was up against at the school he attends, which is one of the many reasons on why I’m so passionate about advocating for gifted children. My son is in the first grade and is an accelerated learner; as are most gifted. This week the class started “cursive prep”-hybrid between cursive and manuscript. My son taught himself cursive when he was in kindergarten…so when they started cursive prep he instinctively went straight into actual cursive. Sadly, his work came back marked up. After speaking with the teacher it was concluded that my son would need to stop the cursive and focus on learning cursive prep (even though the end result would eventually be cursive). This was mainly because by the end of this year the class would be graded on their ability to write in cursive prep…her response to the cursive was since he was not in the third grade, (when cursive is taught) she cannot grade actual cursive. Where is the common sense? I’m currently trying to work with the school for an exception because it makes no sense to me that he would need to spend time writing cursive prep. when it could be used executing or practicing his cursive-or am I just crazy? As your point mentioned earlier, it is hard enough that he sits in class waiting and repeating things he has known and accomplished long ago. Explaining this to my son was awkward because here I am trying to encourage him to humbly embrace his love for learning but now I need to tell him that these are the rules for first grade? -sigh. This is just so ridiculous that I can’t even begin to address all its wrongness. Not that that will stop me from trying. Why isn’t he being given something esle to work on? That’s like telling a reader that they need to spend all year learning the letters of the alphabet. Really? Easy solution: get a third grade teacher to grade the cursive. Pow. Other ideas: let him learn calligraphy or D’Nealian or some other letter form (or practice the alphabet in Arabic or Greek or Hebrew). He might as well go to school with a sign that says “Please waste my time.” Tricia, I think I’m madder than you! I too had a negative response to this article. I have a learning diability, but I’m higher IQ. I’m not fast at either learning or taking tests. Still, in an area of natural interest and talent, I will be obsessive in studying deeply and widely. My mind meanders and doesn’t take the most efficient routes. Quickness isn’t the same thing as intelligence. Many people with quick minds simply have good memories, whether or not they are all that brilliant. Well, I’d have to say that having a quick mind does mean that you need something different in school. Just because some people process more slowly doesn’t mean that gifted learners with quick processing speeds should have to wait. They should be allowed to move at their own pace. I kind of feel like you’re discounting quick processing, and I’d disagree with you on that. I’m not saying it’s necessarily superior to deep thinking, but it has it’s own strength, and it doesn’t need to be denigrated or have the implication that you either think quickly or deeply. Some people do both. Sending my gifted children (now adults) to the ‘good’ public school system was the worst mistake of my life and my biggest regret. Although both children graduated from a prestigious private high school and are attending college, the damage done by the public schools, particularly to the profoundly gifted child, lingers on. The schools are not equipped to handle these kids and don’t really want to learn how. My profoundly gifted child maxed out the elementary school reading assessment in the second grade –( it only went as high as grade 12 so the child tested at 12th grade level in second grade). I could easily have home schooled my two but didn’t, thinking I was doing the right thing by socializing them with the rank and file. Huge mistake. Don’t do it. Keep them home and teach them yourself. You know, everyone finds what works best for them – and it can be classroom to classroom. We educated all of our kids in public school (except when I homeschooled for three years while we were in Germany) and had pretty good success. I know of others who have not, and have found a good fit with private or charter schools. Of course, I’m a big big fan of homeschooling, but it’s not always the best fit for every family. I am glad you found what worked best for yours – it makes a difference. Great article! In one of our daughter’s first grade conferences, her teacher told us that our daughter needed to work on being more accepting of kids that aren’t’ making good behavior choices in the classroom. I didn’t know if I should laugh or cry. She wasn’t being disruptive, or disrespectful in giving them the stink eye. Our daughter loves learning and is highly gifted. I would get tired of kids who weren’t there to learn taking up instruction time being told to go the the hallway, or the class being yelled at for a few kids bad behavior. We later switched schools! So far so good! Better learning environment for her (a smaller parochial school) and she’s commented several times at how happy she is there! This is EXACTLY the issue – why is always the gifted kid who has to adjust? Errrrrr…..
Where do I start? First version was a book for this comment! Here’s the short version. Son has late July bday. K was all day everyday and socially and emotionally not ready. Went at 6 and was more like a first grader anyways. Moved 2/3 way through K, got sent to 1/2 day K and wondered why he was going to preschool! Great! Skipped 1st grade. Moved to Canada in grade 3 when he was coded and given an IPP. New school is a PYP school (now an IB accredited school)! IPP ONLY had Rees goals. Be more collaborative with in groups. Be more open minded within group work. And can’t remember right now the third one but along the same lines as the other two. I repeated asked where is the academic goals? Finally got them to put something in for math and differentiation for it. Another was editing work. Somewhere along the line he got it in his head that a teacher told him he couldn’t go back and look it over to make corrections if he made a mistake. I got six goals, 3 behavior, 3 academic. Last report card, only behaviors are on it. Get new one in grade 4 and again, only behavior no academics. New teacher is willing and open to try different things for him and it works till old teacher returns from leave. Now he starts reading an average of 75 minutes a day in the class. I am asking what is happening that this is going on. Why is he having to repeat math facts he masters years ago until he gets 100%! He got ONE wrong on addition because he clearly multiplied. Waste of a year! Seriously considered homeschool but we but heads and he really does enjoy the socialnessof school. Class sizes ballooned even further to 35! Up from only 31-32 (past two school years). School forced to get another teacher. One from the states with years of gt teaching. He is now doing algebra and writing has grown leaps and bounds. He actually tells me about what his ISP he was working on, the math questions he is rocking (top points) and loves his challenges. She differentiates three different levels. I cannot thank her enough for relighting the fire within him. He loves to read and I can’t seem to find enough books that are still age appropriate for him to read that aren’t complete crap. I might recommend something but nope, she has to be the one to reccomend. That’s fine at least he’s still reading. Now I’m terrified for next year because he goes to the middle school. Away from PYP (YES) but I asked the division what programming I should expect and it’s completely up to the school and teachers to figure that out. They are full on inclusive which is okay but they are mandated to meet his needs. Yeah right, I see what happens when the teacher is incapable of meeting his needs! Read 75 minutes a day is what happens. I work in learning support so I totally get the behavior issues and academic issues that hold kids back. That’s who I work with but they also need to do more for our high kids. Refuse to subject acceleration, no grade skipping, no holding kids back either for that matter. Could we be setting our kids up for any more failure? I have felt since we moved here that the grade levels are about 6 months behind here. The first half of the year for both kids was a repeat of the last half of the year prior. Daughter isn’t gifted in the same way but she is bright. She struggles more with perfectionism and I think at holds her back. But then again, the cut off is the end of FEB. yep, 4.5 yr olds in K! No one knows their letters or numbers, shapes or colors. And our school is over 40% ELL. I struggle with the guilt that I did this to my kids. I moved them and put them in a less than ideal learning situation. I work to forgive myself for being human because I want what’s best for my kids. This experience of living in another country has been good overall. Even though Alberta is supposedly the most progressive of the provinces in Canada for funding for gifted kids, our division does NOTHING for them. Ugh. Thanks for listening. Wow. This deserves a book as a response. I feel and understand your frustration and worry and anger and everything else. Wow. Just wow. You are a living example of what alienates parents from schools, kids from learning, and society from progress. I was the kid reading piles of books when I was done with my work. The school did test me out as gifted, jumped me a grade for reading class. A few months later, they asked if I wanted to skip a grade. By that time, everyone in the grade above had their nose out of joint about a 3rd grader being in the high 4th grade reading group, so I listened to my self-preservation instincts and said no. Middle and high school had honors and AP classes, so were somewhat better. I was the impetus for my school district implementing a gifted program, but they started from kindergarten up, and it didn’t reach high school till after I graduated. Occasionally, a teacher would complain to Mom about my reading in class. Mom would check to make sure there wasn’t room for improvement, gradewise, then tell the teacher to leave me alone. Had homeschooling been a possibility my folks were aware of at the time, we would have been. Now, I have one kid that is obviously gifted, and the other 2 are at least very bright. The failure of public schools to meet my needs or my husband’s (another gifted kid) is one of many reasons why we homeschool. Really? I am awed that readers are not seeing the hypocrisy in this article. Well intentioned, yes, but what is it with armchair critics and perfectionistic ideals? If you think it’s possible to be perfect in the classroom, kindly post some guru-magic instructions instead of complaints. So your expectation is that the teacher now perform to common core, write 27 IEP’s, give individual lesson plans to 27 students ranging from low performing students, past low performing brilliance, and up to high performing academic superstars, AND write 27 notes describing how he/she has addressed the needs of each student so perfectly? Teachers are the ones to support; not bash. Most teachers really do want to be the best, but have thrown in the towel for lack of support and compassion. Maybe a little less critiquing and a little more appreciative support is in order here. My entire family was “gifted” and we all made it through just fine Lisa. It’s about life, love, compassion, and support for all, not about defending one child unless you intend to defend the teacher or the not-so-great performing student too. I think you should take some time to read some other information on my site. I AM a teacher! Read this one: http://www.giftedguru.com/five-crazy-laws-of-teaching/. I understand all too well the pressures and time constraints teachers face. 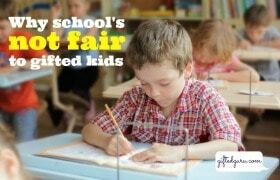 My expectation is that in spite of all of that, teachers will be fair to gifted kids, and they aren’t always. I agree: teachers need and deserve support, but we all need to look carefully at our practices and evaluate if they’re fair to all students. I’m glad your family made it through just fine. Not all kids do. It’s about all the things you said, and that’s my point. And I do defend teachers. Take a moment and look at that, too. The whole site is full of resources for teachers. I think perhaps you saw too narrow of an example of my opinion. If there’s anyone more supportive of teachers than I am, I want to meet that person and become his best friend. That said, I stand by my opinion: school isn’t fair to gifted kids and it won’t be until kids aren’t criticized for learning quickly. And if you don’t think they are, come sit in my chair for awhile. If you think that supporting teachers means you can’t call out wrongdoing, then you and I have a fundamental disagreement about what support means. It doesn’t mean agreeing with wrongdoing, and I still believe this practice is wrong. I am a gifted child in the reading category. I am in the 5th grade but have a 9th+ grade reading level. My school has a gifted and talented program, yet some kids are not allowed to participate including me, even though we have higher scores than some of the kids on the gifted tests. (I’m in the 99th percentile) And what angers me even more is that my class covers reading topics that I learned on my own in 2nd grade. (the same year I finished the Harry Potter books) I am interested in Chemistry yet we don’t cover it until 8th grade, and my school library has non-fiction books that are meant for Kindergarton from the 90s. My teacher has tried to give me a suitable program for me but still has to teach the other struggling or average kids. My math skills are average but that is most of what my class does everyday, yet my math is only average in my district. It pains me when I hear someone. Who. Talks. Or. Reads. Like. This. So please don’t try to have your gifted kids partnered with the struggling kids. And PLEASE PLEASE PLEASE DO NOT under any circumstance say that they can’t work ahead. If kids like me do not keep their brain working, even if it’s easy they will actually fall behind. I have seen that happen in my class, and that kid turned all rude to the teacher too. I thought that I would just get my comment out there because it was all just gifted parents. And you always need to see a different point of view every once in a while. Even under a code name. Thank you so much for taking the time to write! You brought out a lot of important points for adults to understand (especially having a great library so smart kids can find stuff to read on their own). although, I don’t understand how sometimes, parents especially take the time to comment their opinion about their possibly gifted child when they could be taking the time to teach. Teach their child to take advantage of their ability. And, teach them to have fun. With you, siblings, everything. The gifted children have been kidnapped. Captor: Do not speak to me or I will kill you. Child 1: Hey, child 2 what do you think the bad guys are plotting? Child 2: I don’t know, what are they plotting? Captor: Tricky, very tricky, our plan is to…. I did not use the actual names of characters or the exact wording for copyright restraints. Yep…sorry. So, are you getting some good brain stimulation somewhere else? I am 18, and have heard–do hear this constantly. But it goes beyond that. Once at the high school level–if the gifted child hasn’t completely shut down–being gifted causes social tension. We either learn to work at a slow pace, never really focusing our brains, or we continue to finish to fast. Sadly, many of us decide the first option; since we stop actually engaging our brains, we make mistakes and our grades drop, therefore closing several doors in life at an early age. But if we are to follow the second option, we become that person that frustrates the other students. School could mean so many wonderful things. However, it becomes something we have to get through, an obligation, a cultural must. 12 years of waiting to start your life and do the things that challenge you, the things that thrill you. We put our genius on hold for 12 crucial years of our life. How many of us remember to turn it back on after being released? Thank you so much for writing this article. What you describe was exactly me at primary school. Now I am at high school and the teachers are complaining about me reading too much. This resulted in me no longer being allowed to read. I came accross this website while searching for gifted student resource. I am with my son (4th grader) who missed school because he refuse to go. He said kids keep making fun of him, calling him names and basically bulling him. These has happened last year. The entire time … not only once his teacher try to support him rather blamed him for every little thing that he is short of rather than encouraging him for his talent and his reading skill, for his high score. … They have treated my son as if he is weired. He tells me what happened and beg me to not say anything to the teacher or she will think he is todletelling. My son is in gifted education program … he already hates school because of what he is facing. I can’t afford to send him to private school but he is not getting what he needs from the public school he is attending. He is not accepted the way he is, not appriciated or enouraged, not challenged. I really don’t want this year to be the same as last year. But what do you do when your gifted child is miss understood and not getting the attention that he deserves and infact consider as if he is much less of he trully is. The kids keep tearing him appart rather than accepting him the way he is. Any advice appriciated. I can feel your pain on behalf of your son, and I’m so sorry. I wrote a post on how to handle this kind of thing – you can read it at http://www.giftedguru.com/6-steps-to-take-when-school-isnt-meeting-the-needs-of-your-child/. I’d follow those steps. If you need more help, just ask me! Ok, I’m last to the game as usual, but this article made me burst into tears! I feel like I am punishing her by sending her to school. My daughter “hates” school! I went into the whole public school thing with my eyes tightly closed thinking I did it…it will work for her too. She has an amazing school (the best in the district), really great teachers ( I base this comment on others) and a strong principle. She has been placed in advanced reading classes and advance math classes but still comes home every day saying she is bored and hates school. Private school is financially out of reach. I’m just heart broken. I don’t know what to do. Can she accelerate to a different grade? I am in a gifted program and the math teacher goes on explaining one concept for 2 days when most of our class understands it in 5 minutes, this is a complete waste of time in my mind. When I go to read she takes away the book and gives it to me after the class period is over so I have nothing to do while she in constantly explaining the same concept. My school does not let us bring books to class time because ” it distracts you and you have iPads ” from grade 4 and up and it’s frustrating because I always finish work first and there’s nothing to do. If I do being one, they expect to see my work not finished or something like that and they get mad at you. It’s so annoying because last year I was allowed to bring a book now this year I’m not. It gets boring p,aging on my iPad, because the only thing to do is this very unchallenging game for math. Any idea what to do? I mean if I do bring one, not being one, spell check’s fault. I truly wish that I had found this site several years ago. I am a mother of three, 14, 8, and 5. My eight year old son Mark is highly gifted. Unfortunately, I too have experienced and still is, the behavior problem notes which are constantly being noted in folders, sent in emails, or via phone calls. Luckily, when he was in the 2nd grade, his Gifted Teacher was the Absolute BEST!!! She understood him. She challenged him. She even taught me things to do at home with him. She taught him as well as the other Gifted children in his school how to play chess. A few of them went on to compete in a statewide chess tournament and my son came home with a 1st place trophy among 2nd graders. This was so exciting to him. Mark likes to make EVERYTHING a competition. He loves to challenge himself and others all of the time. Unfortunately, due to a natural disaster, we were displaced and relocated to Humble, Texas. I got my son tested for GT and he passed but I soon learned that almost all of the school districts here run their GT program much opposite of those in Louisiana. There is no such thing as taking a complete gifted class for all subjects; that’s only offered to the privileged private schoolers. My son has expressed to me that he feels like he’s back in the second grade because everything his teacher is teaching is something he learned in the 2nd grade. I’m almost afraid to check my emails or answer my telephone because the “Behavior Problems” notes and calls have been overwhelming!! He blurts out answers.. He corrects other students rudely… He raises his hand in the air for no reason.. He this.. He that.. Blah Blah Blah… and now she is afraid that he is starting to lose friends and his hugs (that he has ALWAYS like to give since a toddler) are inappropriate. On his progress reports, he gets all A’s but in conduct it’s an F. This frightens me because I don’t want my son to be labeled a “Trouble Maker.” His teacher expresses that she knows that he understands right from wrong and she questioned if there is anything going on at home that she should be aware of. At this point, I really didn’t know what to do but finding this site has helped me a lot. For me to see all the stories which are so similar, if not the same, helps to relieve some of the stress I have been having. I work with Mark on his behavior and social skills but I realize that there is more that needs to be done. I just have to figure out “what”? …and Lisa, I would like to add that it was so kind of you to create this site. Thanks! Thank you so much for this kind comment. You made my day! This is exactly what happens to me, but also I would probably add that gifted students get bullied a lot. I have talked to many gifted kid she about this, and each one agrees with me. Once we got determined as gifted, everyone started to leave us. At my school, two years ago in grade two, we had this gifted club. As you could see, it was for gifted kids and we all became close. This came up as a conversation one day, and everyone agreed with me. Even if the teachers tried to help, nothing would work. The students would still see us as to smart for our own good. That’s what pretty much made me socially challenged. I had to deal with bullying for many years, at least three, and it wasn’t just verbal, it was also physical. Now they’re admitting it, that they thought that I was different since I was gifted. And thanks to this article, my parents gave me this chart to mark how many hours a day I read. At school, it’s about 3 hours out of a eight hour school day. But I have to say being gifted does have its upsides, you get to do more advanced work, you get to now kids who are older than you better, and you probably get the most attention. I was bullied as well, and studies show that a majority of gifted kids get bullied as some point. Three hours a day, huh? I hope you like to read! So I was reading this article and the amazing comments on it and it got me thinking. I was one of the kids in my elementary school that would get bored with lessons that were very simple but explained in the longest way possible, so I hid a book under my desk and read it for the majority of “learning time”. I am going to be a junior next year and starting the IB program and I’m honestly happy about doing this program and excited to challenge myself! One thing that I have to say though, is that even in middle school my friends in the honors classes (we all got grouped in to each particular honors or non honors classes based on our standardized test scores and not our actual skill level) they could tell I was insanely bored in the normal classes. I would just sleep and just talk all the time. Especially when I had block period days (each day we only had three classes and each period was an hour and a half) where we’d only go through around three PowerPoint slides and read a few pages from an outdated textbook in history. Let’s just say I got bored and my grades dropped. Moving onto high school and being in all honors has put me a little behind than what I thought it would though. It’s almost like I’m bored in normal classes but struggle in honors classes. And I think it’s the fact that when growing up getting bored with school and then going through the motions of everything being so easy, then suddenly they say “take honors to get into a good college!” it hit me that now I’m definitely in the median or a lot lower than that. LOVE this! May I add another? Coloring does not belong in high school math classes!! I don’t know how I came across this article because whenever I search anything about gifted kids and school, I always find the articles that explain how gifted children can be in trouble at school or feel like they don’t fit in and other issues. THIS article is EXACTLY how I feel for all 3 of my children. My twin boys are both gifted and in 5th grade. They just turned 11 yrs. old, in January. They are really good boys and do not get into trouble at school. They are straight A students and score very high on state testing. They are often in bad moods, very irritable and difficult, when they get home from school. I believe it’s from having to sit and being bored out of their little minds, all day! I ask, “What did you learn today?” They actually explain their frustration to me. They are learning a little bit of geometry and LOVE it but, they learn very fast and want to move on. The class learns ONE thing and stays on it, for a few weeks, when the boys could learn a new thing, every day. I feel so bad for them and I see the love of learning, slipping away. I have contemplated home schooling but always think that it is better for a teacher to teach them than for me to do it. I don’t think they would listen to me, as well and I feel a teacher is more qualified to teach them. We are in a good school district too. I also have an almost 15 year old, daughter, who is a freshman in high school. She is also a straight A student with 4 honors classes and also takes advanced math classes, since 6th grade. She is in a 10th grade geometry class right now and currently has 106% in the class. She is also very bored in school and feel that most of her days are wasted because she learns so quickly. She had a 4.25 GPA, last quarter and has consistently earned high honors, every year since 6th grade (there was no honors program, here, before that). I am TRULY blessed that my children do not struggle with school but I always feel sad that they are not being challenged or feel like they are not learning. We DO have a “gifted” program but it consists of my boys being taken out of class, two days a week for a 1/2 hour, each day. To me, that is NOT a gifted program and they need to be with other kids that learn at a quicker pace and I think they would enjoy school, so much more. Thank you for writing this and letting me see that there are other “gifted” but “normal” kids out there! Oh, man. This was hard to read. It’s a reminder of why I do what I do. Wanting the best for your children makes you a wonderful advocate for their education! While there may be subjects that you don't want to teach directly, there are amazing online (and possibly local) programs where they can take a single subject in a classroom type setting, but at their pace. This is such a great article! As a former early education teacher I really tired hard to make the gifted children the “normal” pace and then have extra time set aside for the kids that needed additional help. It made such a huge difference in the life of my students and even the level at which those “slower” students learned. It raised the bar for them and 9.9 times out of 10, it caused them to work harder and exceed their own expectations of themselves and what they were capable of doing! Now as a homeschooling mom, I’m so thankful that I don’t have to watch my son come home with notes like this… because I know he would! Being able to provide him the environment to work at his own pace and curiosity level is such a blessing! Oh, agreed. This is one of the many wonderful things about homeschooling. As a teacher let me say genuinely, I’m sorry! I have had many gifted students over the years and I’m getting better at identifying which areas they are strong in and how to challenge them more however I wouldn’t say Im the best at it. We try (or many of us try) to create inclusive classrooms that suit the needs of all students but we to are under time restraints, program guidelines / restrictions and material deficits. I want to leave you all with two thoughts 1. The new educational reforms are slowly allowing for more inquiry projects and open ended questions that allow for your child to push his/her learning in which ever direction he/she wants. Change is coming but slowly 2. Elementary Teachers have 20-35 students all at different levels. In one gr. 4 class, I had 2 kids at kindergarten reading level, 2 gifted, 2 English language learners, 4 ADHD (all with varying strengths and needs), and 11 IEPs. How would you do it? PS. I do love my job and there is nothing in the world like working with students and help shaping their minds and who they want to become. There are programs out there that can help depending on the school board and supports within the schools themselves. Pushing my students to challenge themselves is a joy. So despite my comments I would like to ask you how have teachers help your gifted kid? Are there things that some teachers have done that your child has responded to positively? Making a list may help other teachers see what strategies they are missing or haven’t tried yet. All gifted kids are gifted in different areas and still have needs as well. Help me support my students by sharing what others have done. For ideas, I write about them consistently, so please read the articles posted. They are chock-full of them!